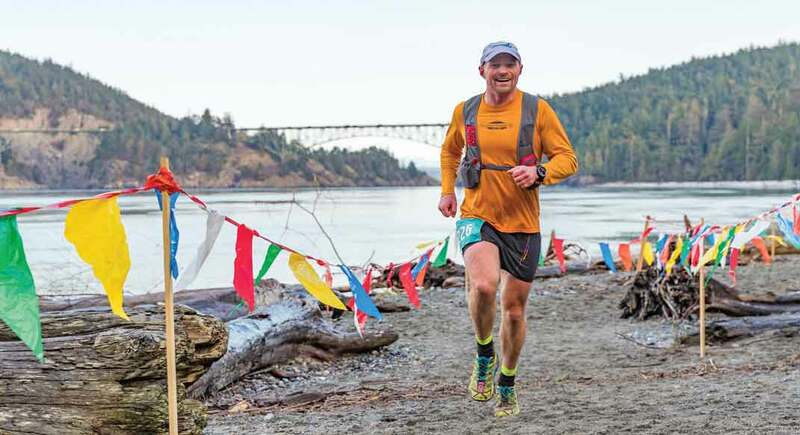 Woody nears the finish of the Deception Pass 50K in Oak Harbor, Washington. Except that Woody, 40, of Bellevue, Washington, is quite the opposite. He’s an accomplished mountaineer, skier, triathlete, mountain biker, rock climber and yogi. He’s finished self-supported runs of California’s 211-mile John Muir Trail, and Washington’s 12-peak Tatoosh Traverse and Infinity Loop—a double summit of Mount Rainier and complete circumnavigation of the peak in a single, 99-hour push. 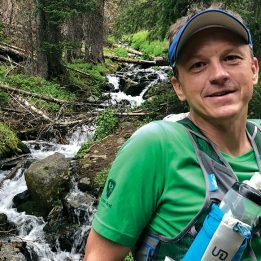 His racing resume reads like a bucket list of the world’s most grueling races—Badwater, Tor des Geants, Dragon’s Back, UTMB, Susitna 100, Arrowhead 135, Plain, HURT, Western States, Bigfoot 200, Moab 240—with a handful of podium finishes among them. “I search for races with the lowest finishing rates. Those are the ones I want to do,” says Woody, whose bright blue eyes and broad smile convey a mix of enthusiasm and humility. While most people might have to relinquish all responsibilities and societal obligations to pull off the kind of adventures Woody pursues, he’s no dirtbag living alone in a van; he works full-time as the vice president of operations at a senior-care resource company called A Place for Mom. He’s also a loving husband, devoted father to two young kids, an Army veteran and Airborne Ranger, West Point grad, Stanford MBA grad, wilderness advocate, former board president of the outdoor-recreation advocacy group The Mountaineers and a regular volunteer on the trails. Early mornings and diversified skill sets run in the Woody blood. Gavin and his younger sister, Kirstin, grew up spending a lot of time on their family’s cattle ranch in California, in the unincorporated town of Woody. It’s named for their great great grandfather, who headed west in the mid-1800s in search of gold and ultimately homesteaded in the foothills of California’s Central Valley. Woody’s running career didn’t get off to a roaring start. In high school, he got lapped during an 800-meter track race. But when he joined a junior ROTC program and went on to attend West Point, then Army Ranger School and Airborne School, running became an integral part of his life. In 2000, when his platoon got stationed in Italy, he joined a group of guys who ran together. On weekends, they’d travel to cities like Florence or Vienna or Venice to sightsee on Saturdays, then run marathons on Sundays. 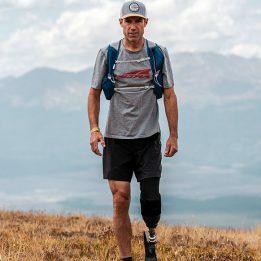 In early 2003, a few months after completing his first Ironman in Austria, he was deployed for the initial assault setting off Operation Iraqi Freedom. His troop parachuted into northern Iraq, thinking they’d be there for a week. It turned into a year. He and his fellow soldiers had gone to Iraq with optimism, wanting to believe they could help the Iraqi people by stabilizing unrest. That hope waned over time. In combat, Woody witnessed deep destruction up close. He lost friends—both American soldiers and Iraqis—who were hit by IEDs, maimed or killed. His base was frequently attacked at night with mortars, setting off explosions and sirens that kept everyone on edge. One night, a fellow soldier left his room for dinner. When he came back, a mortar round had left a hole in the ceiling and another in his bunk, exactly where he’d been lying hours earlier. “It was just a terrible chapter in my life,” says Woody. Upon his return, Woody focused his energy on business school at Stanford. There, he reconnected with an old high-school friend named Sara. 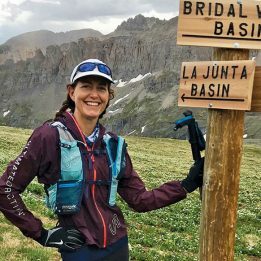 They began dating, and her passion for mountain adventures quickly rubbed off on him. 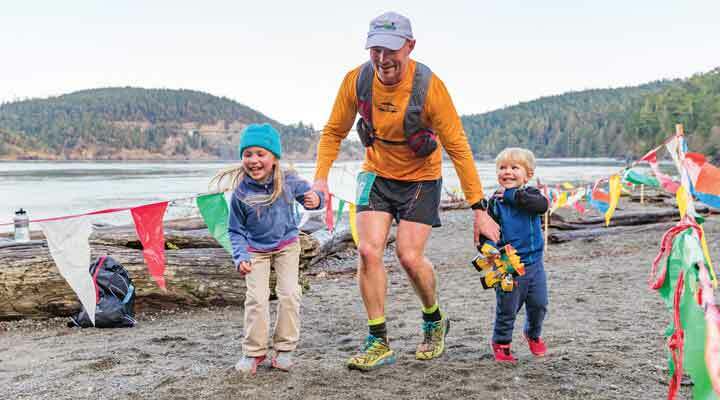 Sienna and Tyler join their father in the finishing chute of the Deception Pass 50K. Perhaps this was never truer for him than at the 2016 Tor des Geants, a 205-mile race in the Alps. Woody struggled with lung issues for the second half of the race. Then, nearly 170 miles in, he suffered a strained quadricep. The only way he was able to make progress was to walk backward, which he did for 30 miles. When he finally reached the finish line in Courmayeur, Italy, and his kids rushed into his arms, he felt grateful—as he always had—for the difficult steps that had led him there.